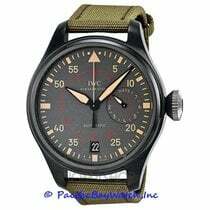 Additional Information: Perviously owned IWC Big Pilot Top Gun Miramar gent’s watch, Model # IW5019-02.Black PVD ceramic and titanium 48mm case. Ceramic PVD bezel. Green Anthracite colored dial with Luminescent stick and Arabic numeral hour markers. Luminescent minute, hour and seconds hand. Stainless steel PVD crown. Titanium case back. Automatic movement, IWC Calibre 51111. Kevlar green fabric strap with steel PVD deploy buckle. Hours, minutes, seconds, date and power reserve indicator. Power reserve up to 168 hours, 7 day. Water resistant up to 60 meters / 200 feet.